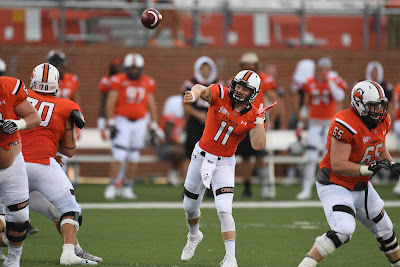 BUIES CREEK, N.C. – Daniel Smith threw for four touchdowns and ran for another and Campbell defeated Valparaiso 49-10 Saturday at Barker-Lane Stadium. Smith set a school Division I era (since 2008) record for touchdowns accounted for in a game and the Camels started 3-0 in the Pioneer Football League for the second time since 2014. The Camels (4-2, 3-0) remained on top of the PFL standings after winning their third-consecutive outing. After scoring on its first possession of the game, Valpo (2-4, 1-2) surrendered 49-straight points. Campbell forced four turnovers, including three interceptions, to run its FCS-leading totals to 20 takeaways and 14 picks. A red-shirt freshman from Leesburg, Va., Smith completed 18-of-27 passes for 257 yards, while rushing for 40 yards on five carries. Montel Goods led the Camels with 88 yards on the ground. Jaquan Brooks (South Point) had five catches and Zach Roderick four, including two TD receptions for Campbell, which finished with a 484-274 edge in total offense. The Camels held a 227-97 advantage on the ground and averaged 5.3 yards per carry. After entering the game ranked eighth in the country in scoring defense (13.0 points per game), the Camels held Valpo to just 10 points and only 4-of-19 third-down conversions. Carlos Merritt had 10 tackles, plus his PFL-leading fifth interception, while Ray Miller made nine stops for CU. Nick Turner led Valparaiso with 10 tackles. Valpo’s Chris Duncan completed 10-of-21 passes for 119 yards and was intercepted twice. Cody Boxrucker led the Crusaders with 53 yards on 13 carries. Jean Rene had six catches for 57 yards. Campbell out-gained Valpo 378-125 in the opening half and scored on six-straight offensive drives. Smith threw for four first-half scores and ran for another as the Camels led 49-7 at the break. The Camels also had three first-half takeaways that resulted in 21 points. Valpo had to drive only 27 yards to take an early 7-0 lead after Goods fumbled on Campbell’s first play from scrimmage. Starting quarterback Jimmy Seewald ran three yards on a fourth down and two at the CU five; then Boxrucker put the Crusaders in front with a two-yard TD run. Campbell answered, driving 75 yards on 10 plays. Smith completed all five of his passes and Goods scored from one yard out on fourth-and-goal. Mitchell Brown’s PAT tied the score at seven with 8:15 left in the first period. After a three-and-out, the Camels marched 61 yards on 10 plays to take a 14-7 lead. Smith hit Trey Sanders for an 11-yard gain on fourth-and-five at the Valpo 25. One play later Smith connected with Roderick for a 15-yard scoring catch with 4:32 left in the quarter. Following a second-straight three-and-out, Valparaiso punter Alex Ng fumbled the snap and Campbell’s Wale Ashaye picked up the ball at the 15 and ran in for CU’s third special teams touchdown of the year. Brown’s PAT increased the margin to 21-7 with 3:06 left in the opening period. After a third-straight Valpo three-and-out, the Camels marched 63 yards to take a 28-7 lead. Smith hit Trey Sanders on a 46-yard scoring pass down the left sideline with 1:23 to play in the first quarter. Smith found tight end Michael Wooten down the right seam for a 69-yard scoring pass with 11:44 to play in the second period. Smith’s 13-yard run capped a seven-play, 50-yard drive and gave the Camels a 42-7 lead with 3:01 left in the opening half. Levi Wiggins intercepted a Duncan pass – Campbell’s third takeaway of the opening half – and gave the Camels a first down at the Valpo 29 with 1:45 to play. Smith hit Roderick on an 8-yard scoring pass for a 49-7 lead with 0:23 to play in the second quarter. Valparaiso drove 60 yards with the opening kick of the second half and cut the gap to 49-10 on Dimitrios Latsonas’ 32-yard field with 10:57 to play in the third quarter. Campbell returns to action next Saturday (Oct. 14) at Dayton in a 1:00 p.m. kick-off. Valparaiso hosts Marist Saturday at 2:00.